It’s summer and keeping your body hydrated is as important as staying away from the summertime ailments like fatigue, drowsiness, headaches, and heat stroke. After a trip outside in the sun, a cool glass of juice helps you cool down. Thankfully, nature takes care of us and provides us with the right type of fruits needed for the hot season. Watermelon is one such summer fruit. And, watermelon juice benefits you in many ways! Watermelon is nature’s way of keeping us cool, healthy, and fit during a hot summer. What does watermelon juice do? Is watermelon juice good for you? Read on to find out more. 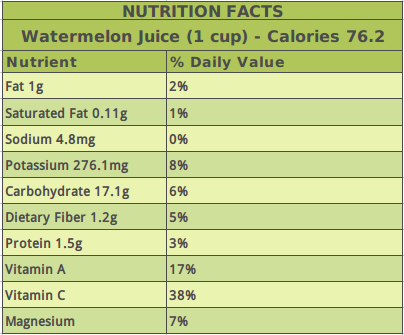 The nutrition obtained from every cup of watermelon juice is summarized in the table below. Watermelon is a very rich source of potassium and vitamin C. Both help in the quick recovery of worn-out muscles and fatigue, which are common symptoms people experience in the summer. Even after a workout in the gym, a glass of watermelon juice will help restore the fluid levels and sore muscles. It contains trace amounts of proteins, along with vitamins A and C, and minerals such as potassium and magnesium. What are the benefits of watermelon juice? This wonderfully tasty and refreshing fruit juice helps to keep our health in top shape. Read on to know why this juice is good for you. An amino acid known as citrulline present in the white rind of the fruit helps to normalize blood pressure. It relaxes our arteries, so it maintains a good blood flow while improving cardiovascular functions. The abundant amount of vitamin C and beta-carotene help to reduce cholesterol levels and maintain a healthy heart. Watermelons also contain phytochemicals such as lycopene, which is known to be a powerful antioxidant that helps prevent cardiovascular ailments. The amino acids potassium and magnesium in watermelon combine to help keep blood vessels healthy and maintain smooth blood flow. They also help maintain proper electrolyte and acid balance, resulting in stable blood pressure levels. Potassium works as a diuretic and helps removal of toxins and excess salts. Citrulline, which is found in large amounts in watermelon, is converted into arginine, an essential amino acid to improve blood flow and relax blood vessels. The positive effect of improved blood flow can be seen in the form of more energy and also acts as a stress-buster. Arginine is also known to help reduce muscle soreness after exercise. According to studies conducted on animals, citrulline interferes with the accumulation of fat in cells. While it’s unknown if it has a similar effect on humans, having a glass of watermelon juice just before a meal can help you eat less. It is low in calories and can help you lose those unwanted pounds quickly. Watermelon juice helps to flush out ammonia and uric acid from your body, as well as cleanse the kidneys. Studies have shown it to be helpful for kidney stones as well. Watermelon seeds are particularly helpful in cleansing the kidneys. So make sure you buy a watermelon with seeds if this you want to use it for this purpose. The antioxidants in watermelon are known to protect us from free radicals, which may cause ailments like arthritis, asthma, stroke, and cancer. Regularly having a slice or two of ripe and fresh watermelon will provide you with the required amount of antioxidants. It will also help your skin look fresh and supple. 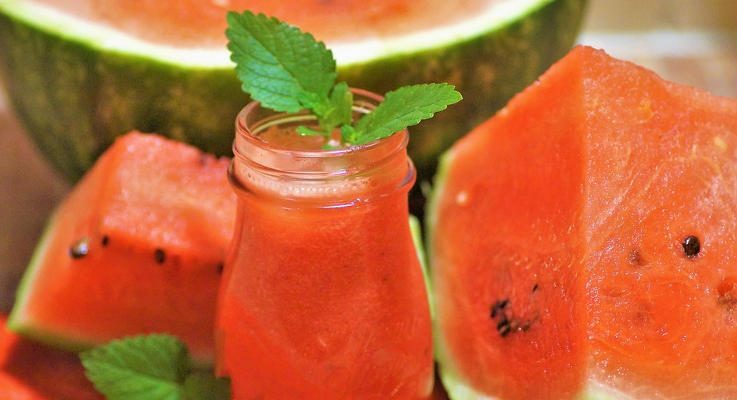 Here are a few simple and delicious watermelon juice recipes for you to try if want a different way to consume the fruit rather than simply cutting and eating it. Making watermelon juice at home is quite easy and safe. And, store-bought juices may be loaded with sugars and preservatives. So, it is best to make our own juice. Chop the watermelon into coarse pieces. Then, add the ginger and lemon juice in a blender and blend until smooth. Strain through a fine sieve and garnish with mint leaves and ice cubes. Stir to combine. Serve in tall glasses and enjoy this tasty, nutritious, and healthy juice. Mix all the ingredients (and sugar if needed) into a blender, and blend until smooth at the slowest speed available to form a homogenous blend. Serve in ice-filled glasses or refrigerate for six hours before serving. Stir slightly before serving. Watermelon is a beneficial fruit, but an excess of anything is bad. Consuming too much lycopene may cause diarrhea, vomiting, and other digestion-related issues. And, those who have hyperkalemia should consult their doctor before consuming watermelon in any form. In summary, watermelon juice benefits us in many ways. So, make some healthy drinks using watermelon as your base ingredient this summer. Enjoy the hot weather and keep you and your family in top health this season. Watermelon_juice.html, last accessed August 3, 2017. “10 health benefits of drinking watermelon juice,” Bel Marra Health, March 2, 2016; http://www.belmarrahealth.com/10-health-benefits-of-drinking-watermelon-juice/, last accessed August 3, 2017. “Watermelon juice as a post-exercise muscle relaxer,” American Chemical Society, August 14, 2013; https://www.acs.org/content/acs/en/pressroom/presspacs/2013/acs-presspac-august-14-2013/watermelon-juice-relieves-post-exercise-muscle-soreness.html, last accessed August 3, 2017. Hobbs, S., “Fresh watermelon juice,” Taste; http://www.taste.com.au/recipes/fresh-watermelon-juice/0a93dde1-ee99-412b-8125-33a15d60f492, last accessed August 3, 2017. Cope, C., “Watermelon and Cucumber Juice Recipe,” Serious Eats; http://www.seriouseats.com/recipes/2013/06/watermelon-cucumber-juice-with-mint-recipe.html, last accessed August 3, 2017. Arab, L., and Steck, S., “Lycopene and cardiovascular disease,” The American Journal of Clinical Nutrition, June 2000; 71(6): 1691-1695; http://ajcn.nutrition.org/content/71/6/1691s.full, last accessed August 3, 2017.